The Republic of Congo (pop. 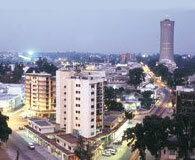 3,547,000; GDP/cap US$1,539) is in West Africa, between Angola and Gabon, bordering the South Atlantic Ocean. It is the fifth largest oil producer in Sub-Saharan Africa. Political tensions between President Denis Sassou-Nguesso (incumbent), and supporters of ex-president Pascal Lissouba, resulted in full-scale civil war in 1997. Despite the signing of a peace agreement in March 2003, the security situation remains unpredictable. Protection of property rights is weak, as it depends upon a dysfunctional public administration and judicial system.